After years of wanting to get them I finally pulled the trigger. I am officially an adult with braces. Every since my early teen years my teeth had began to crowd and in my opinion it just got progressively worse over the years. So while I have never been that person who shyed away from smiling, I have always been self-conscious of my smile. But even beyond that my teeth has caused me constant pain, because of my bite I have chronic headaches, and get lock jaws quite often. So I took the first steps towards correcting a “flaw” and relieving myself of nagging pain. The first major thing that I considered and you should too is finances! I was super excited when I confirmed that my current Dental Insurance would cover a portion of the cost of adult braces. If your insurance doesn’t cover adult braces most Orthodontist I researched had an in-house payment plan, or you can apply for credit (Carecredit) and of course you can pay in full. Speaking of Orthodontist your next step is to research and find a great one, I scoured the web for reviews and came across a Orthodontist I felt would be great for me and accepted my insurance. I am intentionally withholding the name of my adult braces provider until my treatment is complete. I was not sure of what to expect when I arrived for my first consultation, but I was pleasantly surprised by the amount of information I was provided. After having a quick photo session, verifying my insurance, having a detailed consultation with the Orthodontist and shown all my options for treatment (Invisalign was NOT and option) I was able to leave armed with specifics about how long my treatment would be and the EXACT dollar amount I would be responsible for. The last step before I could proceed was to relay all my new-found knowledge to the hubby. After he found out that the treatment would be from 12-15 months and that our part of the financial responsibility was do able for our families budget he was all in. Let me back up you read right I will have my braces for only 12- 15 months instead of the standard 24 months thanks to a technology I chose to go with named Suresmile. Welcome to my journey to a straighter smile and less pain! 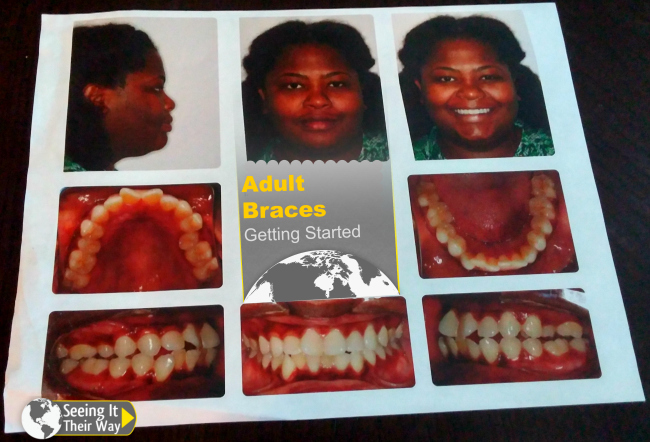 Have you had adult braces or are you considering it? I would love to hear about your experiences.